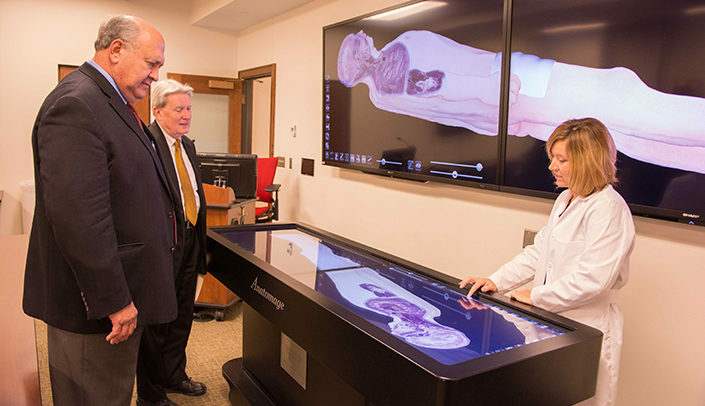 The Anatomage Table is a 3-D, life-sized, interactive anatomy tool being incorporated in the some of the world’s leading medical institutions, including the University of Nebraska Medical Center. Utilizing it in your curriculum can be one of the easiest decisions you should ever make. With a touch of a button your finger becomes the scalpel, allowing users to dissect 4 different cadaveric models. There is no mess or odor and the added bonus is the “undo” button. If you make a mistake or want to “go back”, it’s just a click of a button. 2. The work is already done for you! The Anatomage Table comes with a pre-packaged curriculum organized by body region and system. Each image annotated and ready to use. An excellent tool for updating anatomy presentations. 3. Your course outcomes and evaluations may improve. Research shows that students enjoy having technology in the classroom and learn the material better. Students who have utilized that Table note it to be a beneficial and effective tool in preparing them to enter a health care profession. 4. Case study-based learning is better. The Table has over 400 case studies arranged by organ system pathology and includes a patient history along with cross-sectional imaging. Did you know using patient case reports helps students learn and remember information better? 5. Your class will be more interactive. Need a tool to get your students up and out of their chairs, interacting with each other? The life size anatomical models in the Table allow hands-on interaction and increased student engagement while the faculty facilitate learning. 6. It’s a really cool resource. In addition to its added educational value, the Anatomage Table is also a great recruiting tool. UNMC’s College of Allied Health Professions was the first in Nebraska to get a Table! Ready to get started? It’s easy! Faculty have created a simple, short orientation packet for you and your students to use to get acquainted with the Table. 8. Get the “BIG” picture. Frustrated with textbooks that show single cross-sectional images? The Table’s Software allow you to post CT or MRI exams straight to Blackboard or Canvas giving students the opportunity to scroll through all of the images in axial, coronal & sagittal planes. Now that’s what we call the BIG picture! 9. Start small and grow. Worried you don’t have enough time? Start small by adding a Table quiz or an assignment to your lecture. As an instructor, the more you “play” with the anatomical models, the more creative you and your students can become. Encourage students to review anatomy with specific anatomic assignments. As the students locate anatomy on the table, they can capture their images with the Table’s screen shot function and create a power point or word document to turn into you. The added bonus is that you can then use the images from their power point for future lectures or assignments. Kim Michael, MA, RT(R), RDMS, RVT, is Anderson Distinguished Professor and the Associate Director of the Interprofessional Academy of Educators at UNMC. As an Associate Professor in the College of Allied Health, she is Director of the Diagnostic Medical Sonography program with scholarly interests in sonography education and the use of technology in medical education. Tanya Custer, MS, RT(R)(T), is an assistant professor in the department of Medical Imaging and Therapeutic Sciences within the College of Allied Health Professions. Her scholarly efforts have concentrated on the role of the radiologic technologists in the treatment of the Ebola patient, using the flipped classroom in the education of imaging science students, using the Anatomage Virtual dissection table in the education of imaging science students and instructional technology and distance education for imaging science education. 3) Custer, T. & Michael, K: The Utilization of the Anatomage Virtual Dissection Table in the Education of Imaging Science Students. Tomography and Simulation, 1(1) 2015.